Director – Rod Blackhurst, Screenplay – David Ebeltoft, Producers – Rod Blackhurst, David Ebeltoft, Arun Kumar, Noah Lang & Josh Murray, Photography – Adam McDaid, Music – Eric D. Johnson, Visual Effects Supervisor – Jacob Owens, Makeup Effects – Gotham FX, Production Design – Rob Ebeltoft. Production Company – Lola’s Productions/Gentle Entertainment Group/Preferred Content Productions/Manhattan Productions/Easy Open Productions/Unparalleled Productions. A plague has fallen on the world, infecting and killing vast amounts of the population. In upstate New York, Ann Marshall makes an encampment out of a car in the woods, struggling to eke out the basics of survival on her own. Her husband Jason left her there while he went to find help but has failed to return. She occasionally ventures to nearby houses to scavenge supplies but there is the ever-present peril of attack by the infected, which requires she cover herself in mud in order to not have her scent tracked. One day, she comes across Olivia and her wounded stepfather Chris on the road. She grants them shelter back at her camp. As an attraction grows between Ann and Chris and he urges her to join them in their journey, Olivia comes to resent this. Here Alone was a directorial debut for Rod Blackhurst who had previously spent a decade making over a dozen short films. Blackhurst shortly after went on to make the acclaimed true crime documentary Amanda Knox (2016). I hope I am not giving away any surprises in telling you that Here Alone is a zombie film. That said, it is very different to any zombie film that has emerged to a point of market glut in the last decade. In fact, Rod Blackhurst keeps the idea of there being any zombies from us for nearly half the film. Up until that point, you could easily think that what you are watching is a social collapse drama taking place in the aftermath of a country-wide plague – think of something like Carriers (2009). 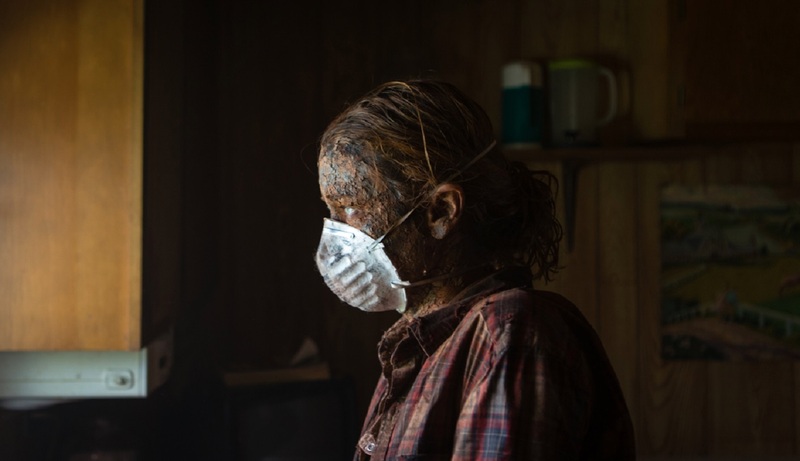 The focus for the bulk of the film is on Lucy Walters and her attempts to improvise the basics of survival in the woods, the strange ritual she must undergo to distract the never-seen infected in order to break in to a farmhouse and scavenge supplies, and the warmth that grows between her and Adam David Thompson and his stepdaughter Gina Piersanti after she comes to their aid. Zombies do not turn up (at least in a clearly identifiable way) until well after the halfway point. It is as though Rod Blackhurst wanted to focus the film on the survival story instead of letting the audience’s pre-conceptions kick in and automatically associate Here Alone with a zombie film. 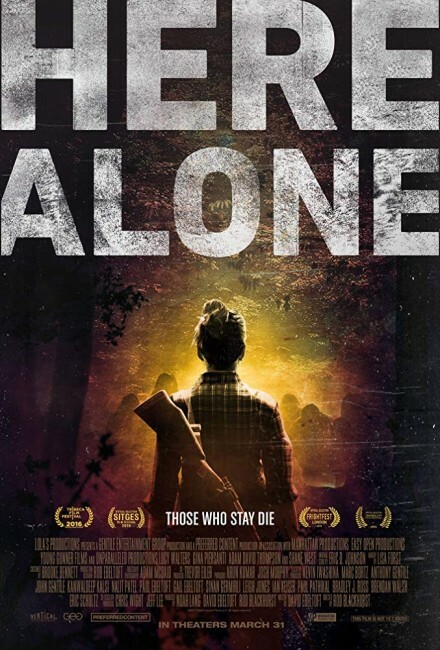 If there is a work you could liken Here Alone to it might be The Survivalist (2015), a minimalist work set in the aftermath of a social apocalypse and concerning only three characters and their meagre attempts to eke out a living together in a small hut in the forest. As opposed to most survivalist fantasies, which love showing people improvising all the amenities of civilisation with their bare hands, Here Alone goes the other way. Lucy Walters sleeps in a car and a tent in the woods, no more than that. She keeps her meagre food supplies in the trunk and her attempts to trap animals are none too successful. Particularly standout during these sections is Adam McDaid’s photography, which takes in the surrounding greenery of the forest, showing Lucy Walters as a tiny figure against the trees or bathing in the mist-covered lake. Much of the first third of the film is almost entirely a one-person show with only occasional flashbacks to Lucy with her husband (the film’s only recognisable actor Shane West).